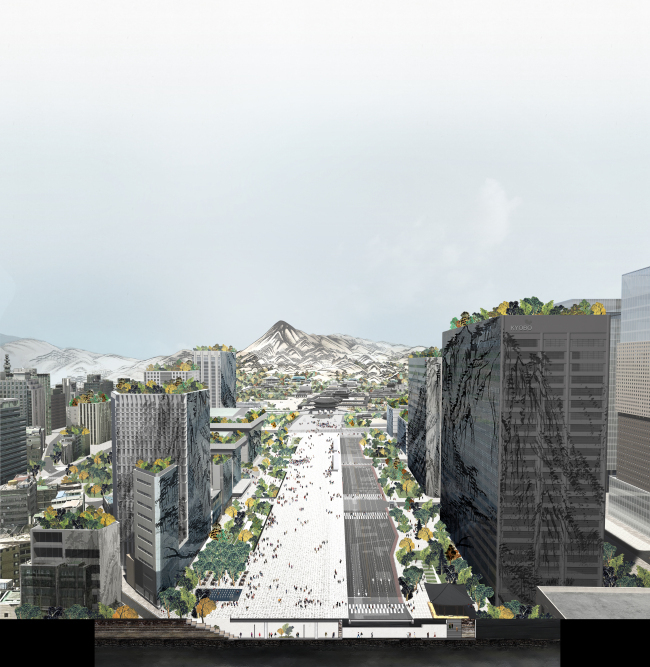 The Seoul Metropolitan Government is to expand Gwanghwamun Square 3.7-fold, create an underground passage connecting major spots in central Seoul and make the area a public transport hub, according to a plan to transform the square unveiled Monday. 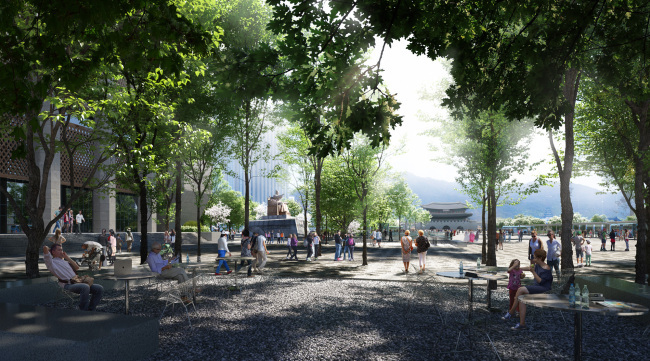 Iconic statues of King Sejong the Great and Adm. Yi Sun-sin at Gwanghwamun Square will be relocated in order to secure an expansive view of Bugaksan and Gyeongbokgung, the palace at the north of the square, according to the “Deep Surface” restructuring plan. The blueprint focuses on restoring historic meaning to the area by re-creating Yukjo Street, the main street of old Seoul, and reducing the lanes of traffic running through from the current 10, as part of efforts to make it more pedestrian-friendly, according to the municipality. The blueprint by a team of South Korean construction design firms was chosen by a team of seven judges, comprising five South Korean experts and two foreign architects. Seventy teams from 17 countries entered the competition after the municipality laid out a plan to restructure the square in April. 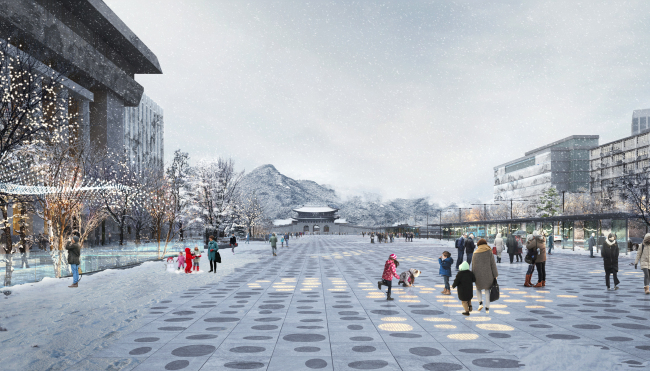 According to the blueprint, the square will be expanded westward toward the Sejong Center of Performing Arts, with cafes, small parks and fountains to be built. The current 10-lane boulevard on either side of the square will be pushed eastward and reduced to a six-lane road. 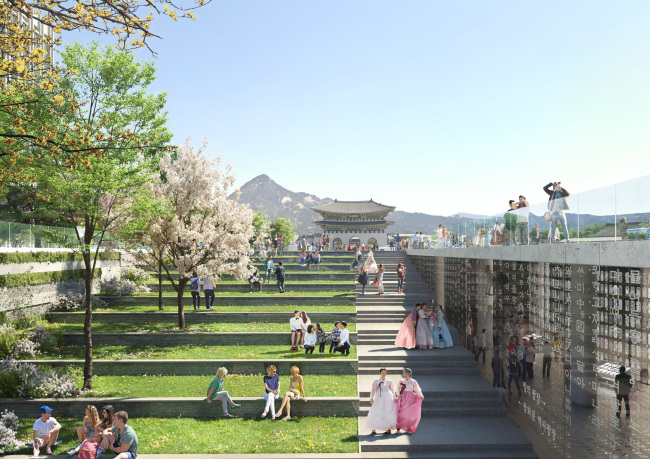 The statues, which slightly limit the view of Gyeongbokgung and its mountainous backdrop, will be moved in order to make more room for large events. The plan, however, is expected to face opposition due to the historic significance of the statues. The statue of Adm. Yi Sun-sin, one of the most respected figures from the Joseon era, was built in 1968. Seoul Mayor Park Won-soon assured at a press conference Monday that that the city government will collect opinions from the people and reflect them in the final blueprint to be confirmed at the end of this year. “We will make a final decision on the situation and sufficiently respect the opinions of citizens through a public discussion that will last until the end of this year,” Park told reporters at a news briefing. 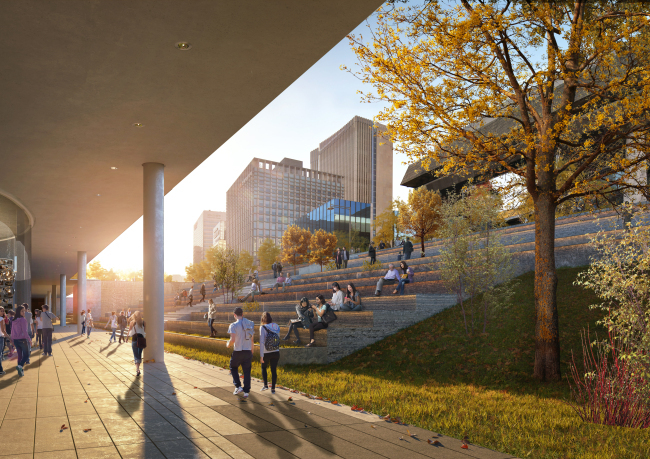 Other plans to transform central Seoul include the creation of a 4-kilometer underground walking path that would encompass the main areas of central Seoul -- Gwanghwamun, City Hall, Euljiro and Dongdaemun. As part of efforts to make Gwanghwamun area a public transport hub, the city government will consult with the central government on hosting a high-speed rail line at Gwanghwamun Station, it said. GTX-A, the first to start construction among three railways serving the greater Seoul area, is an 83.1-km section connecting areas from Unjeong in Paju, northwest Gyeonggi Province, across Seoul to Dongtan, southeast Gyeonggi Province. The line will run at a maximum speed of 180 kilometers per hour. The city government plans to begin construction work to transform the square and build the underground pedestrian pass early next year, with an aim to complete it by 2021. During the two-year construction period, Seoul Metropolitan Government said it would take measures -- such as improving the traffic system and securing roads for detours -- to minimize traffic disturbance and inconvenience to people living and working in central Seoul. The restructuring project will cost about 104 billion won, with 66.9 billion won to be funded by the Seoul Metropolitan Government and 37.1 billion won by the Cultural Heritage Administration. “South Korea’s symbolic square, which is like Trafalgar Square in London and Arch of Triumph in Paris, will return to citizens of Seoul in 2021,” Mayor Park said. Stretching from the gate of the palace Gyeongbokgung, the 557-meter-long Gwanghwamun Square in the middle of the 10-lane thoroughfare opened to the public in 2009. 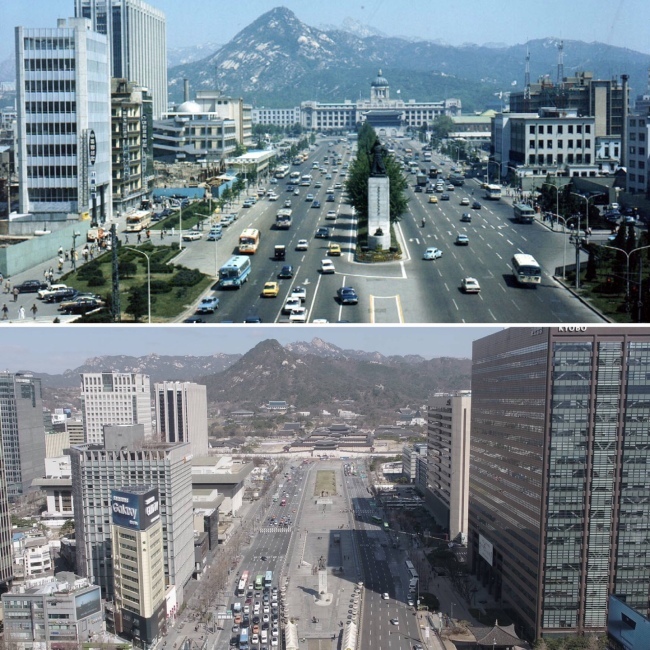 Critics, however, have complained about the five lanes of traffic that run along either side, comparing the square to a gigantic traffic island in the middle of Seoul.